« HN’s April Health Challenge! There’s an idea that we need to load-up on red meats, and the muscle-building proteins – notably carnitine – they naturally contain, if we are to be at peak physical fitness. But years of research do not support this conclusion, and even suggest that both excess carnitine and diets high in the saturated fats red meats contain may be harmful. Overall, there are more clearly healthful ways to get the proteins we need to be healthy and fit. These include vegetable proteins and leaner non-red meats. But low-fat and omega-3-rich fish, especially from low in the marine food chain, may be our healthiest single protein source (unless we have a fish allergy). If you don’t consume much fish today, and worry that fish is difficult or expensive to prepare, we want to assure you this needn’t be the case, especially when we eat the HumanaNatura way and follow HumanaNatura’s OurPlate healthy eating guidelines. Today’s salad meal is a delicious case in point. 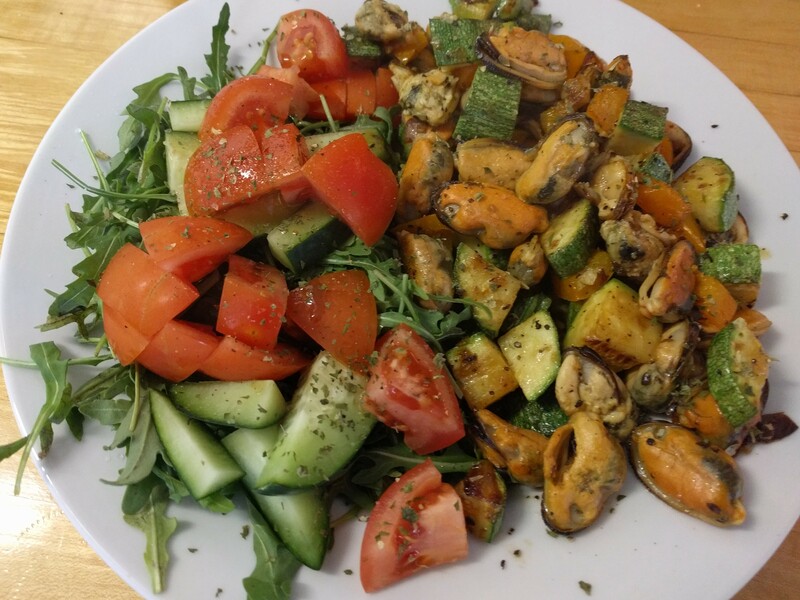 Our sample HumanaNatura meal begins with a serving of previously shelled and blanched mussels, which are then pan-sautéed with crushed garlic, diced onion, cut white zucchini, and sliced baby carrots until all are cooked through. While these foods cook, a simple raw salad base is prepared with fresh arugula, diced cucumber and tomato, and a light vinaigrette dressing. When the cooked foods are done, they are plated alongside the raw vegetables, everything is garnished with black pepper and parsley flakes, and the meal is served promptly. Overall, a quick, inexpensive, and extra-healthy way to get the proteins we need to be fit and at our best – and a model for how we might eat optimally each day, whether we are athletes or not. This entry was posted on April 25, 2018, 01:00 and is filed under Natural Eating. You can follow any responses to this entry through RSS 2.0. You can leave a response, or trackback from your own site.